Medfield High students collaborated on ‘Welcome to Deadfield,’ the Medfield Library’s annual haunted house. The wind howled, tugging at the few remaining leaves hanging on the trees. The cloudy sky blocked the moonlight as rain poured down. The foggy streets of Medfield provided the kind of atmosphere in which ghosts and goblins would feel at home. On this dark and foreboding Saturday night, the eeriest place to be was not outside in the storm. Rather, it was in the Medfield Library, which took a turn for the spine-chilling during its annual haunted house. 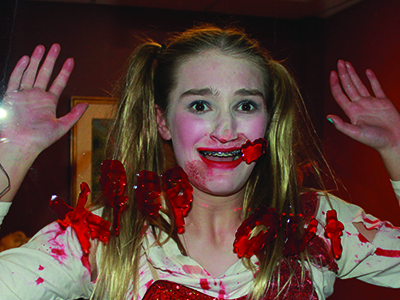 Normally quiet study rooms were filled with screams and terror during the haunted house. 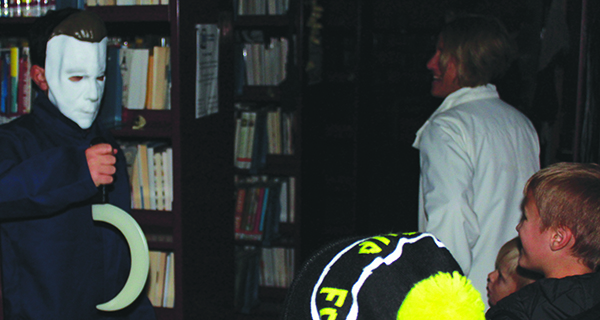 Hundreds braved the weather and lined up in the library to wait for their turn to wander through the basement, where monsters awaited behind each bookcase and door. “My heart's beating, so I’m nervous. It was great, I didn’t like the guy with the mask, that’s just creepy,” said Terri Lynch, whose daughter helped set up the haunted house. “I think they did a great job and it definitely got you going. Young children giggled in anticipation as they heard shouts emanating from the basement and frightening possibilities raced through their minds. Guides led groups around the haunted house, showing them the wicked things that would leave them with nightmares. 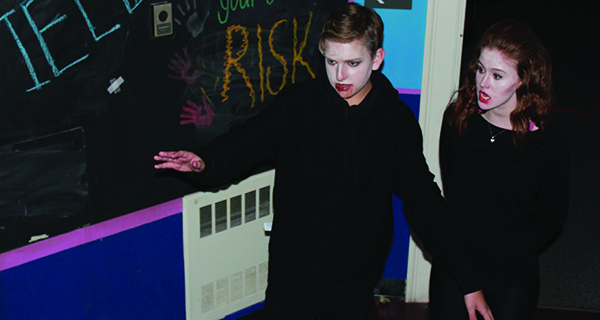 Students from Medfield High School dressed as skeletons, masked murderers and other creatures from our darkest nightmares as group after group hesitantly walked the few steps downstairs to test their nerves in the library basement. Teen Librarian Erica Cote’s favorite time of year is Halloween and she was in the spirit of the season, dressed as the titular character from Tim Burton’s “Corpse Bride.” She had been meeting up with students at the high school to plan this chilling event since after Labor Day. Families walked closely together, not knowing what lay beyond the next book shelf. As families headed back out into the gloomy October night, the Medfield Library reminded them again to be afraid of what lurks in the dark.